Obama’s popularity has really spread around the world. Everything from streets, hotels, and even people are being named after the newly elected President of the United States. For one photographer in Indonesia, it is not the name Obama that has thrown him into almost instant fame, but rather his face. Ilham Anas bares a striking resemblance to the president-elect Barack Obama in this recent commercial. The whole thing initially started as a job for Ilham. “When Obama won, my colleagues played a practical joke on me — they made me wear a suit, a tie, and took pictures of me posing as Obama,” said Ilham. 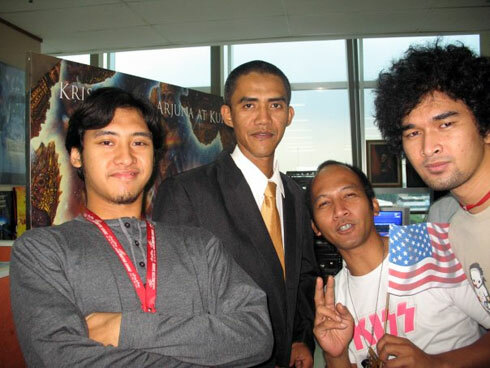 Ilham says he is often mistaken for Obama and people ask to take pictures with him. “I never thought I would be a star in a commercial, then this happened. It’s very fortunate,” Ilham said.